I don't think there should be any sayings on the sticker , I think less is more . I think it's perfect Pete . I know, right! the side caps are still black on the chrome bumpers. maybe a future edition will be a view of the back of the truck. holy CRAP!! It just dawned on me that the sticker is a short bed! that has to be addressed for this sticker run. I make the motion that we use Don's truck for the CC logo (or at least one of the designs) on all of the cards and magnets from now on. It would be a fitting tribute to how much of a pillar he was around here. I'd like to hear Pete's thoughts on using a new logo for the website that pays tribute to HOrnbrod. Some of the more savvy members may have noticed that for the past week the H and O in our website logo has been greyed-out to pay tribute to him. The fact that his truck actually exists plays a huge part in this. The Camo MJ or the American Flag MJ, while both unique in their own rights don’t exist (or if they do no one knows them as well) nor do they hold a candle to Don’s MJ for representation of what this club is all about in my opinion. Don’s truck was clearly owned by an MJ enthusiast. 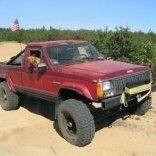 Can’t touch the plain Red MJ version, I feel that one fills a much needed “my truck is stock and I love it the way it is” or “I just got the truck and I’m saving up to build it into what I want” roles. Proportion wise its a swb but the fuel filler door is positioned like a long bed. If you put any other text on it, maybe just "1943-2019" or "Don HOrnbrook 1943-2019"
I agree with Strokermjcomanche that less is more in this instance but having his name and dates or even just the dates tells everyone it's a tribute to someone. yup. a holdover mistake from the 10" vinyl decals that's not on the original 3x5s. I don't remember when I first caught it, but I've been removing the gas door rectangle from all 10"ers since (that plus it's a very delicate detail that doesn't always survive the weeding process). I've passed it on to Dillon that it needs to remain close to the flare. Id proudly display a few around my fleet and garage. Both the original and the tribute look great! Just read this after sending Don a PM. I'm very sad to hear about his passing. What a nice guy. FWIW, when I bought my 87 Laredo, it had ALL the chrome exterior stuff, and Don bought it all! It wasn't my thing. May he rest in peace, God bless him. final version. 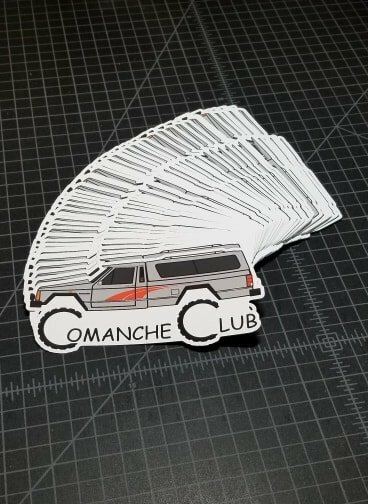 a huge thanks to MoparBrown for lending his skills to this endeavor if there are no other ideas for improvement, I'll send this on to the sticker guy and see what he can do. Just found out the sticker dude is at KOH this week (lucky! ), so next week we'll see what he can do. Thanks, Pete, for doing this. The sticker will be a fitting tribute to Don. Put me down for a couple and let me know the price so I can PayPal some money to you. Yep I'm in for a couple as well! just got this pic from our supplier. I'm driving north in a couple days and so he's mailing them to Michigan to meet me. I'll start a brand new thread for taking orders after I can inspect them up close.